If you’ve noticed your site dropping in Google’s organic search results, you’re not seeing things. This week Google has moved the cheese once again by removing the PPC Ads on the right hand site and pushing the organic search results down to accommodate the fourth paid ad on top. This move is going to significantly impact the auction dynamics in PPC and possibly drive up the PPC Ads prices. Instead of 11 ads on a page, we’ll now see a maximum of seven, with only 4 visible above the fold. Negative SEO – Can it hurt your business? Negative SEO is the latest “buzzword” that is dominating webmaster forums. 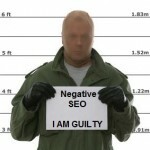 What is negative SEO? Negative SEO is the label given to certain actions aimed at hurting the rankings of your website. These actions could be initiated either by your competitors or malicious individuals determined to bring your site down. Search Engine Optimisation Case Study – Why SEO is so important? Many business owners focus all their efforts on building a website, but never set aside any budget for search engine optimisation. As a result, their site looks good but seldom gets any visitors. Research has shown that 89.82% of all people who search online, never click beyond the first page of Google. In fact, the web page listed in position 1 of Google search results, gets the lion share of all the traffic – a whooping 42.13%.